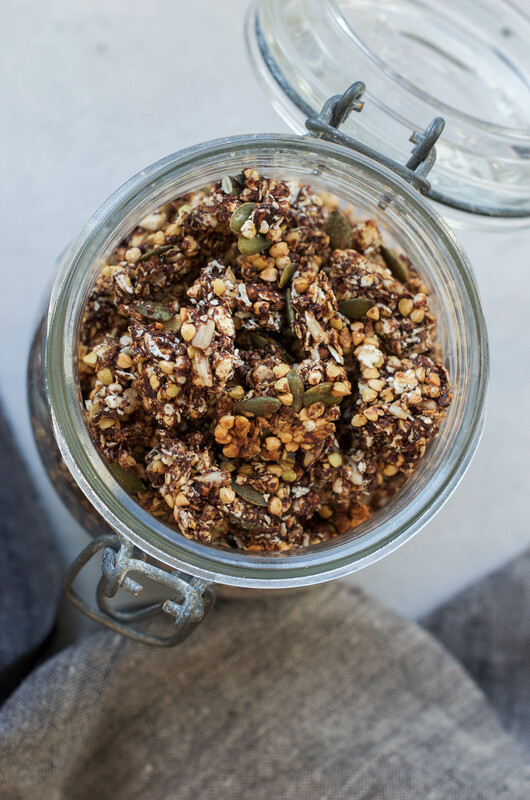 Delicious, chocolaty and full of clusters, this Crunchy Cacao Coconut Granola is sure to become a staple for breakfast ! Enjoy it as a topping on smoothie bowls, with some plantbased yogurt and fruits, or simply with some almond milk. 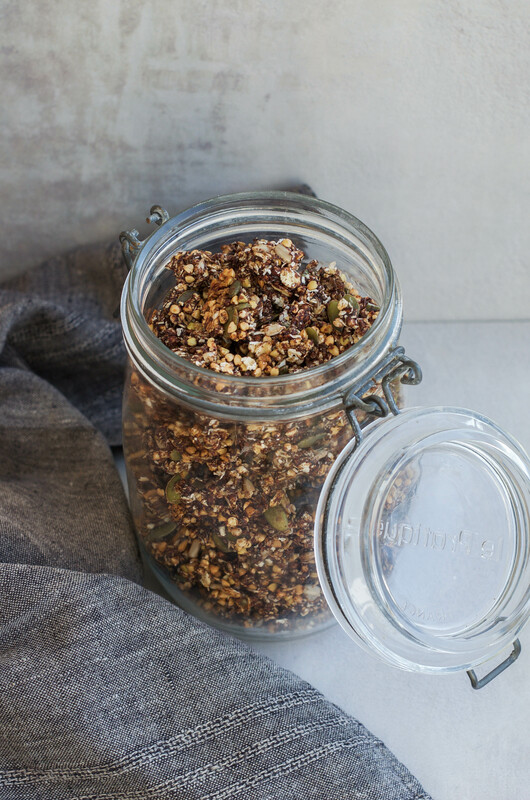 A delicious homemade Granola that happens to make big clusters while being oil-free ? Check. Easy to prepare ? Check. Approved by chocolate lovers ? Check. 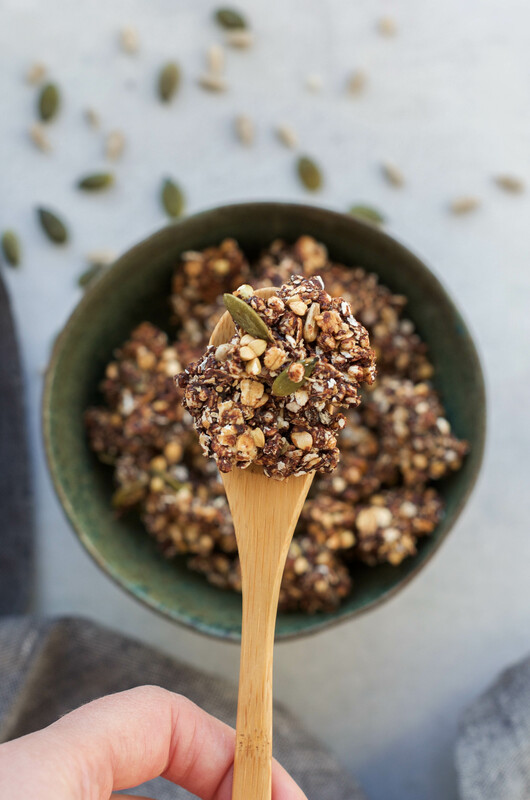 This Crunchy Cacao Coconut Granola is my favorite at the moment, and I’ve made it so many times already ! The granola came out pretty good already after the first try, but I wanted to take it to the next level. Chocolaty but not too strong. Crunchy, with big clusters. Not too sweet (that’s always one of my main goals, since I always find everything too sweet), but sweet enough that others would enjoy it. I think I’ve finally perfected it ! 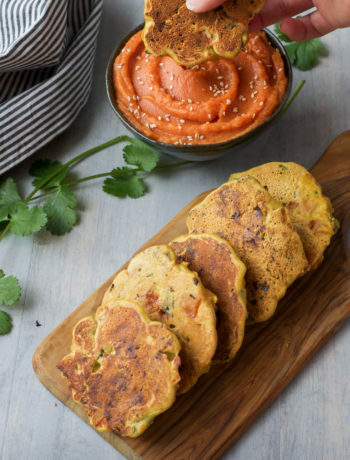 This recipe is oil-free. As you will see on this blog, I don’t really like to use a lot of oil in my baking or cooking. From time to time, I consume coconut oil when following other bloggers’ recipes. I can also definitely use some olive oil (extra-virgin of course!) for salad dressings for instance. But I prefer to consume mostly nut/seed butters, whole foods like nuts, seeds, olives or avocados to get healthy fats in my diet. This is a personal preference since that’s how I feel my best ! One of the advantages of using nut butter in a granola recipe: it helps it clump together. 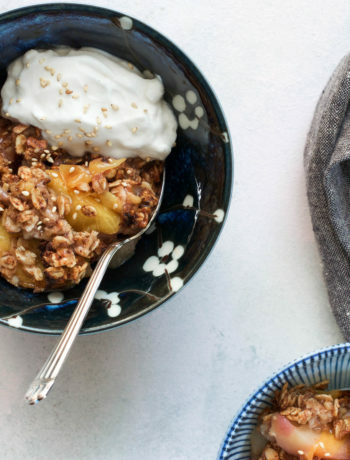 And who doesn’t like big clusters of granola, right ? A tip to incorporate the nut butter easily into the granola is to slowly melt it on low heat with the other liquids: here, I used agave syrup along with cashew butter. You will get a thick sauce, almost like a paste, but it will still be easier to stir it with the dry ingredients this way. Another advantage with this Crunchy Cacao Coconut Granola recipe is that when it has cooled, you can break it down in clusters as big or as small as you want. If you want to grab some for a snack, make big clusters; if you want to sprinkle it as a topping for a smoothie or yogurt, make small clusters ! All ovens are different, so check often to see that your granola is not burning. Remove it from the oven earlier if needed. It is really important to let the granola cool completely for at least an hour, before breaking it into clusters and storing it into an airtight container. This is one of the most important steps to get a crunchy granola. 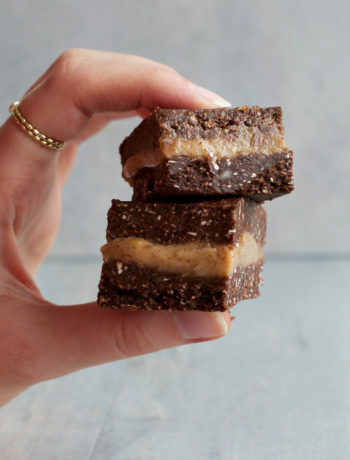 Substitution ideas: You can use any other nut or seed butter that you like, instead of the cashew butter. Sunflower and pumpkin seeds can be subbed for any other seeds. You could even use nuts instead of the seeds ! It is also possible to sub the agave syrup for maple syrup or any other liquid sweetener. Preheat the oven to 160°C (320F). 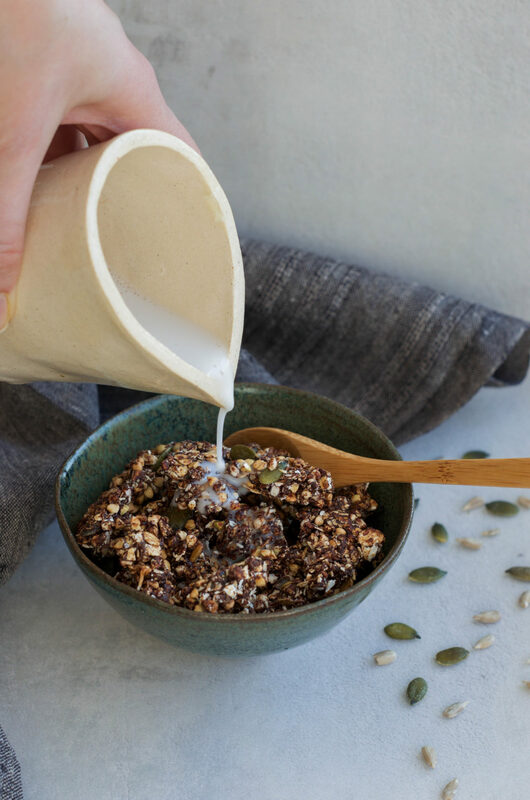 In a large mixing bowl, combine all the dry ingredients: oats, quinoa pops, sunflower seeds, pumpkin seeds, buckwheat groats, desiccated coconut, cacao powder, and a pinch of salt. Stir well. In a small saucepan over low heat, melt together the cashew butter and the agave syrup. Stir well for a few minutes and you will get a thick sauce, almost like a paste. Add the thick sauce to the dry ingredients, and combine. You might have to use your hands to combine it nicely, since it will be quite sticky and thick. Spread the mixture onto a baking pan lined with a silicon mat or with baking paper. Press it down with a spatula so it forms one solid block. Bake it for 22 to 26 minutes, checking often that it doesn't burn. Let the granola cool completely for at least one hour, before breaking it into clusters. If you don't wait enough before storing it, it will not be as crunchy. Transfer into an airtight container and enjoy ! Feel free to sub the sunflower seeds and pumpkin seeds for other types of seeds or even crushed nuts. You can also sub the agave syrup for any other liquid sweetener.